Ladies & gentlemen, a soul crushing trend has taken hold of the South and it has to be stopped. Chefs and caterers are serving unsuspecting patrons plain boiled crawfish covered in spices. Gritty spices on top of plain crawfish. This is not how we boil crawfish in Louisiana! I need a glass of wine to get through this. This is my attempt to educate the country so these lazy chefs can no longer pull one over on you. Live crawfish is usually bought by the sack, and depending of the size of the crawfish, will weigh between 30-40 lbs. 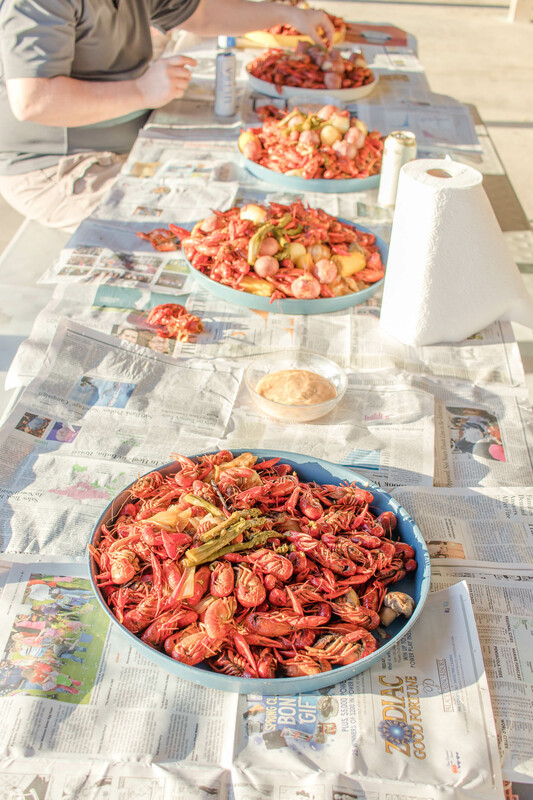 If you are not going to cook the crawfish immediately, be sure to keep them cool on ice. We traveled to Florida with several sacks and they were perfect the next day. 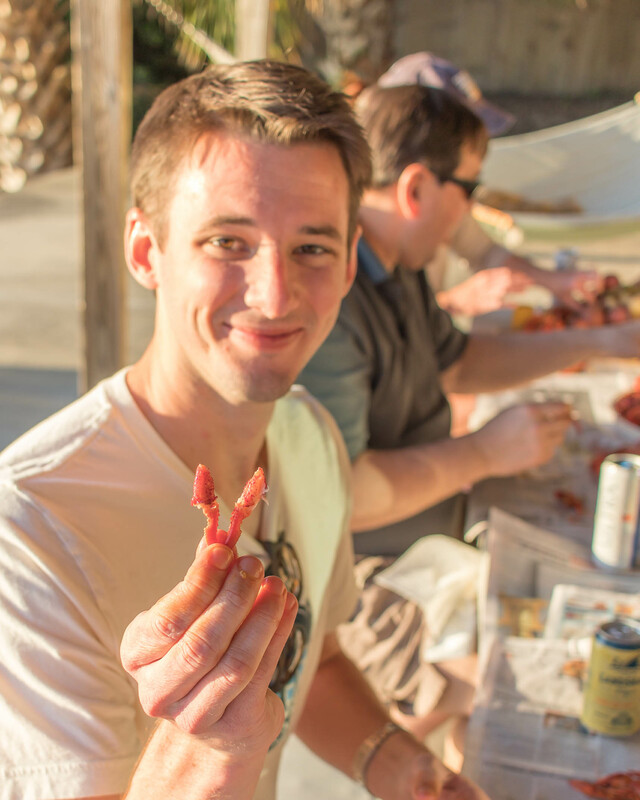 Crawfish are called mudbugs for a reason and they need to be thoroughly cleaned before cooking. We usually spray the sacks down with a hose then dump the crawfish into large coolers for the major cleaning. First rinse. Told ya they were dirty. 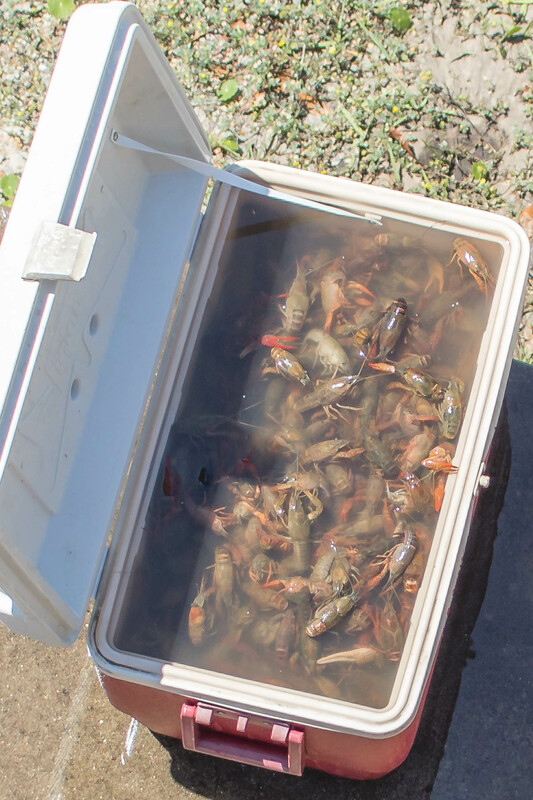 After filling the coolers with fresh water, we close the lid, & let the crawfish swim around for 5 minutes. Closing the lid is important bc those little sucker will escape. Drain the dirty water then fill with fresh water again. Repeat until the water drains without grit ~5-6 rounds. 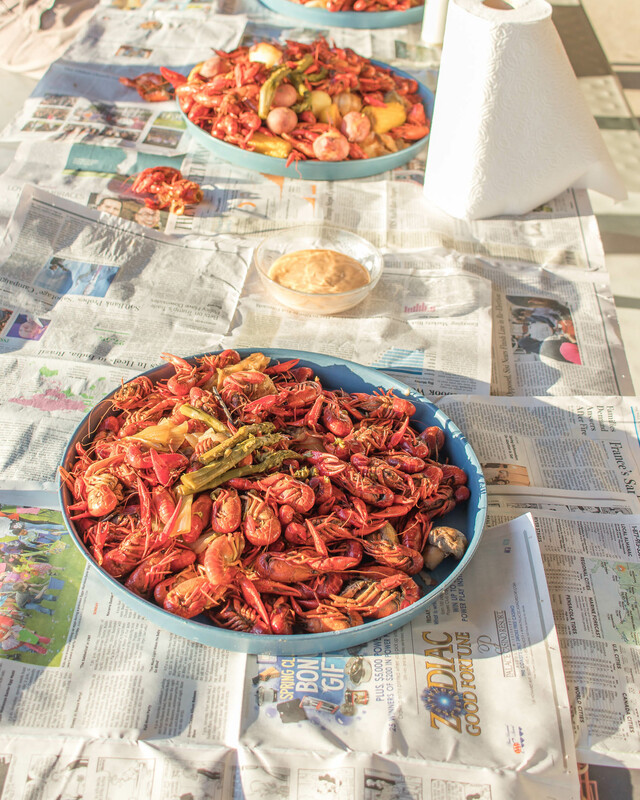 This rinse, drain, repeat cycle is not to purge the crawfish. Purging takes a very long time and the only way that works is by making the crawfish sit without eating so their gastrointestinal systems are empty by the time you boil. There is no difference in taste between purged and unpurged crawfish. It’s only for looks & not worth your time. While you get your water up to a boil using a jet propane cooker & 80 quart pot half filled outside, prep all the fixings. Remove the pot basket and have at the ready to fill with the live crawfish. 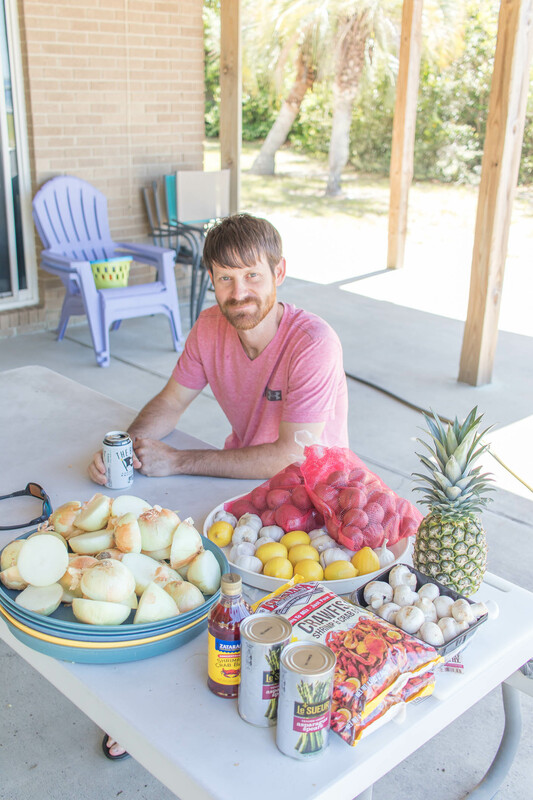 Essential fixings include onions, new potatoes, lemons, & garlic for flavor while fixings like pineapple, asparagus, and mushrooms are optional. You’ve got to try the pineapple though! Sweet and spicy goodness. Once the water starts boiling and you’ve had a few beers, things move fast so prep is key. As soon as the water comes to a boil, throw the potatoes in the plain water & cook for 20 minutes. Remove & set aside. Add seasonings and bring back to a rapid boil. 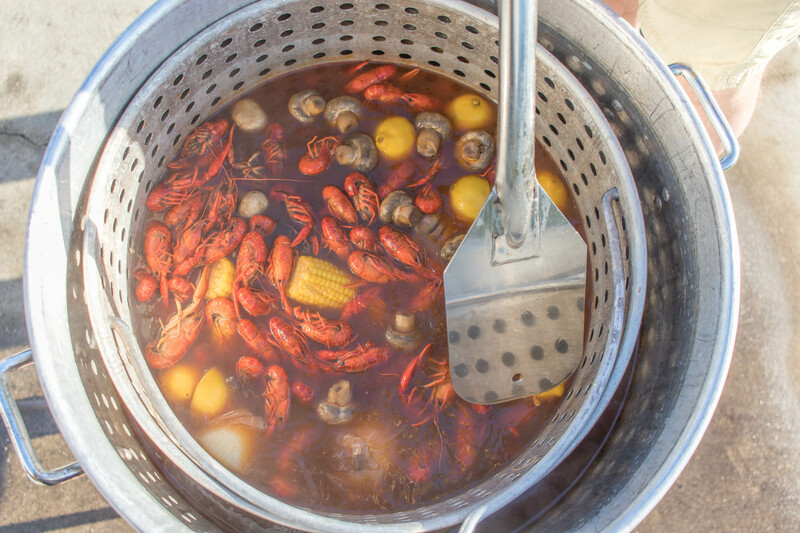 Add crawfish, onions, & garlic to the large basket then slowly & carefully lower it into the boiling water. A strong friend is very helpful for this and a future step. Bring to a boil for 3-5 minutes then shut the flame off. Stir in all the fixings, including the potatoes. Squeeze the lemons then throw them in. Cover and let sit for at least 25 minutes or until the crawfish sink to the bottom. The longer they sit, the spicier they will be. With a friend, lift the hot basket of yummy goodness up and onto the paddle to drain. Serve & enjoy with lots of beer. To temper the heat, a creamy sauce is the perfect compliment. Plan for 3 lbs per person. A sack of live crawfish weighs between 30-40 pounds, which will feed ~10 people. 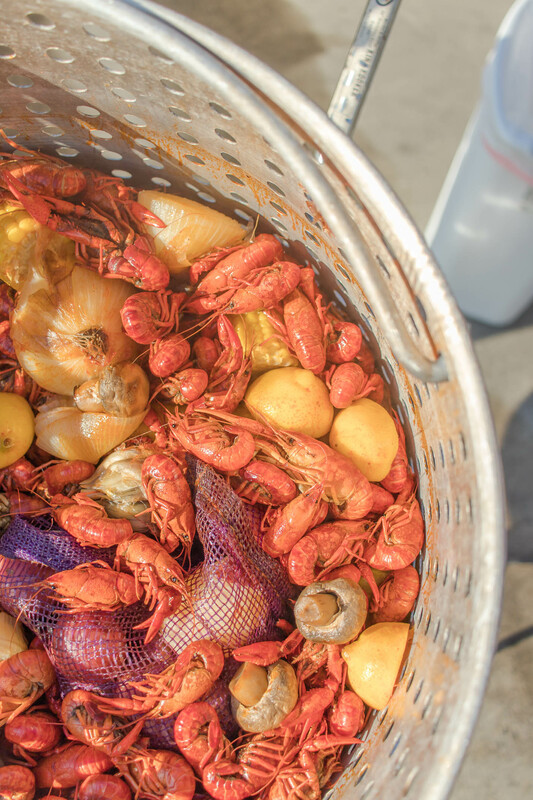 As of March 2019, live crawfish is $2.50/lb. Be prepared to spend $75+ per sack. It is most expensive around Good Friday & Easter. The price fluctuates all season. If you have people to impress, buy Select. I can not stress this enough. Select sized crawfish is a joy to peel and you get the bonus of claw meat as well. It’s expensive though. Like double the price sometimes. Select sized crawfish is best mid-season. If you get Select in June or July, their shells get pretty tough & are harder to peel. It can start as soon as January but they really aren’t worth having a party for until Easter. The season ends in July, when the ponds get too hot. Apparently the red live crawfish are from ponds and pale, muddy colored ones are river. They all turn red when boiled and taste the same so I wouldn’t worry too much about it. 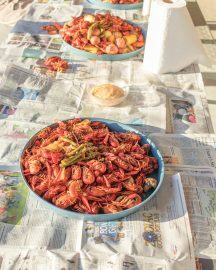 There is many ways to boil crawfish, but I promise this is the best crawfish boil recipe. It’s spicy enough to keep you coming back but not too spicy for kids. 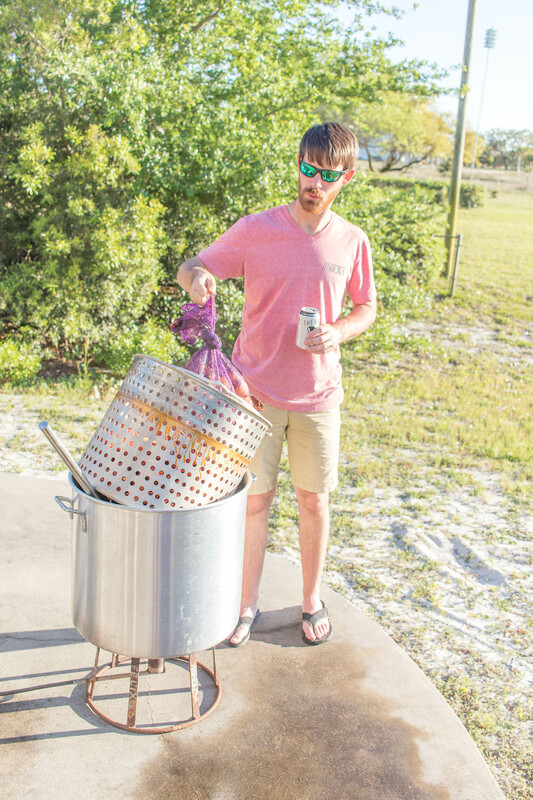 Quickly rinse live crawfish while still in the sack then release crawfish from sacks into a large cooler equipped with a lid & drain. Discard any deceased crawfish. 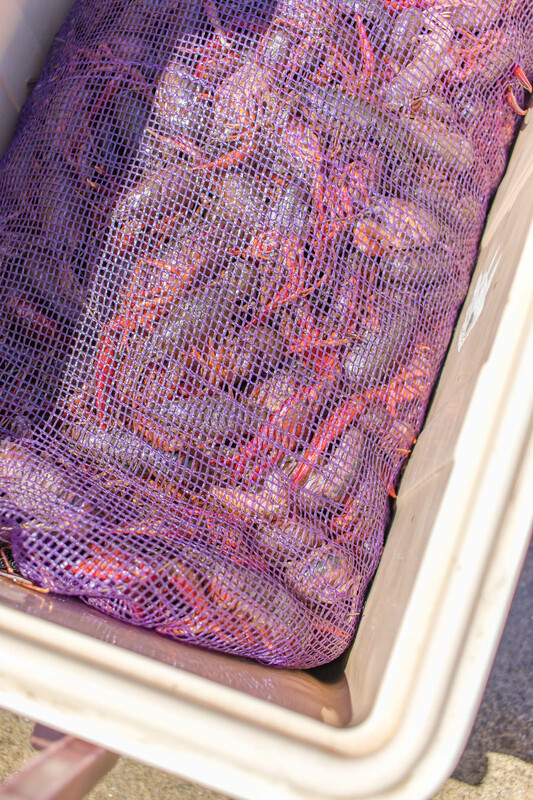 Fill cooler with clean water until crawfish are completely covered. Close lid and let the live crawfish swim around for 5 minutes. A lid is vital as the crawfish will crawl out. Drain. Repeat rinse/drain cycle 5-6 times until water is free of grit. Bring 80 quart pot with basket filled halfway with clean water to a boil using a jet propane cooker. Remove potatoes and set aside. Add dry & liquid seasonings. Bring to a rolling boil. Carefully add crawfish, onions, & garlic. Bring back to a boil and cook 3-5 minutes. 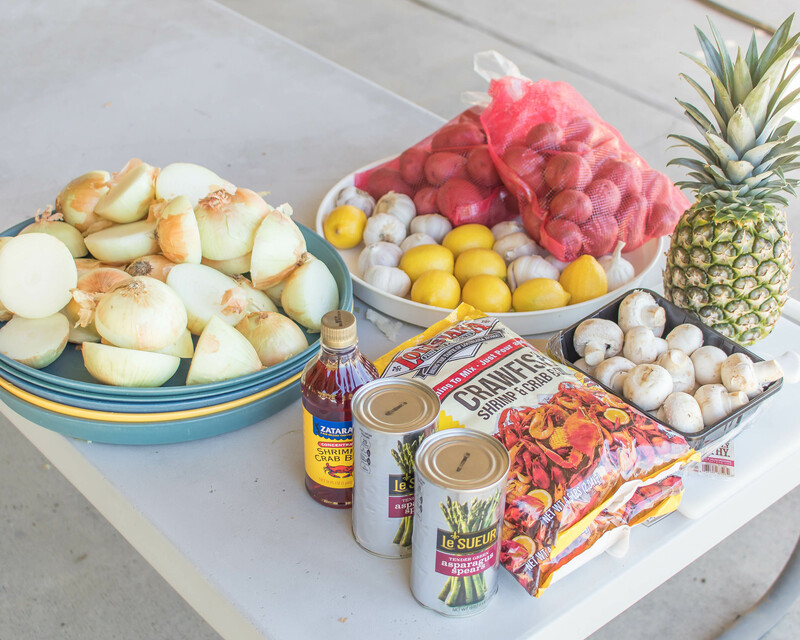 Squeeze 6 lemons and add them to the pot, along with potatoes, and other fixings. Cover and let everything soak for at least 25 minutes, or until crawfish sink to the bottom of the pot. Uncover and, with the help of a friend, carefully lift basket out of hot water, propping it up above the water with the paddle. 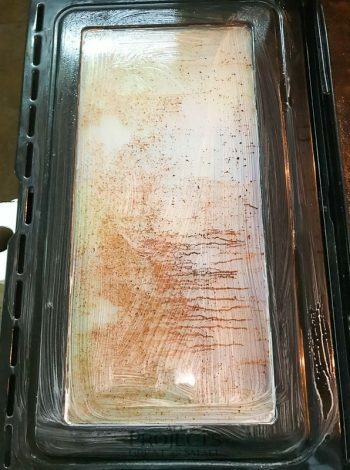 Seasoned boil water can be reused but will be more salty than the first batch. Adjust seasoning with liquid blend then as dry spices as needed. 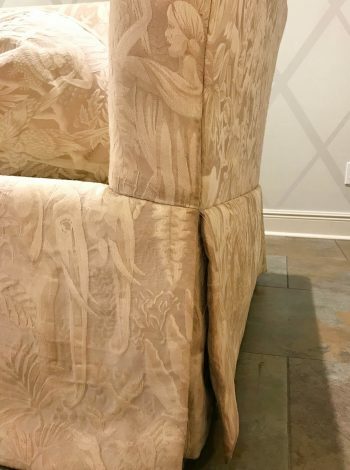 Do you love Louisiana food and home design? Then you’ll love learning how to whitewash your dark brick just like we do down here!